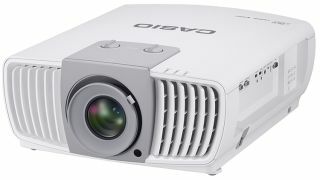 Casio America, Inc. will release the XJ-L8300HN lamp-free projector in June of this year. Featuring native 4K ultra-high-definition (UHD) resolution (3840 × 2160 pixels) and brightness of 5,000 lumens, the company says that the new projector delivers crystal clear projection even on the big screens commonly used in large conference rooms and halls. "With this new product, Casio enters the market for high-resolution, high-brightness business projectors—a market which is expected to grow rapidly by 2020,” according to a company statement. Equipped with a 4K DLP® chip, the XJ-L8300HN projects images of approximately 8.3 million pixels, reproducing the color of images at a higher level than conventional projectors. As such, it is expected to expand business applications of projectors where the audience needs to be shown highly precise and accurate details of the images, including charts, engineering plans and design drawings. With its 5,000 lumens, the XJ-L8300HN is ideal for brightly lit classrooms and the big screens found in spacious venues such as large conference rooms and auditoriums. Built with long lasting lamp-free technology, the XJ-L8300HN delivers an estimated 20,000 hours of projection while avoiding the use of mercury. The XJ-L8300HN is also equipped with a lens shift function to correct for projector positioning and a super resolution feature that enhances the signal of low-resolution movies and images to produce an effect of higher resolution. For additional information, visit www.CasioLampFree.com.